Well, I supposed with the last entry (Part 4 of 5), all that a newbie golfer on a budget should know is more or less covered. Well, most of it. If there is any further questions, feel free to drop me a note and I will try my best to answer them or ask around for you. Anyway, I did mention earlier about my bag and so I thought I share with everybody how I customised my own mix-and-match. Also to give everybody an idea, I will put a price tag next to it as best as I can. 1) The Bag. I got this when I was in San Jose last year. It is almost like a ritual for my dad and I that whenever we step ashore on US soil, we would make time to pop into golf stores like Edwin Watts or Golfsmith to see if we can pick up good bargains. Anyway, I bought this golf bag in the San Jose branch of Golfsmith. It is a generic brand and won't be surprised if its Golfsmith's own house brand. At USD 39.00 (about SGD 59.00), I really don't care. It is a nylon bag and the quality is very good. 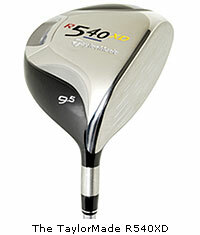 2) Driver - The Taylor-Made R540 XD (10.5 degrees) was picked up when I was in Atlanta. It was an Edwin Watts shop and I spotted this at the Pre-Owned (second-hand) section. The price? USD 100.00 (SGD 150). It just so happened that I was on the look out for a new driver as I using my dad's old Taylor-Made R580 on loan. For a brand new driver that typically cost between USD 400.00 to 700.00 (SGD 600 to 1050), depending on brand. I was thinking that for a hundred bucks, it would be a small risk if I were to buy the club and it didn't work out. As it turned out, the club played beautifully and I was one happy camper. 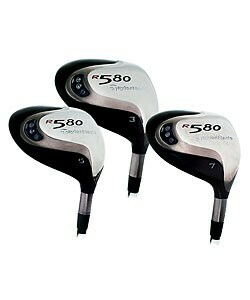 3) Fairway Woods (3, 5, 7) - I am using the Taylor-Made R580 fairway woods which were hand-me-downs from my dad. It was a complete set of driver + fairway woods but as mentioned earlier, the driver didn't quite work for me. Well, since I can't really put a price on something that I don't have to pay for, I shall price them at current second-hand rates on the market. A search on eBay shows that it's USD 75.00 (SGD 113) each for the 3 and 5-wood and USD 50.00 (SGD 75) for the 70-wood. 4) Irons - This set of Titleist DCI 822OS (4-iron to Sand Wedge) is actually a clone set. It was a gift from a business friend, whom initially I was hesitant to use. In my mind, I thought anything not original has got to be inferior. Still, I took it out to the greens for a test drive and was hooked ever since. I was wrong. The irons played superbly. It was definitely heavier due to the steel shaft (I was using graphite shaft before that) and my distance suffered immediately. However, what got me hooked was the stability, probably due to the heavier weight of the club as a result of the steel shaft, of my swing. It took me about 6 months to get back the distance that I had when I was using the graphite set (Callaway Big Bertha 1996 - which I got for SGD 500 in which is another story on its own. Will tell if there are people interested to hear. Let me know.) and another 6 months to exceed my original distance. I supposed the heavier irons also act as a weight trainer as I build up my swing strength. I am playing about 160 yards (144m) with a 7-iron and 120 yards (108m) with a sand wedge. Again, this set was a gift and as such, can't put a price tag on it. Also, since this is a clone set, there aren't any second-hand clones out there (we can only be so cheap) and therefore, I will price this set at current first-hand clone set price. I checked with the local golf shop here in Spitland and the price for a similar model (since mine is quite dated at present time) is RMB 650 which would convert to roughly SGD 130. 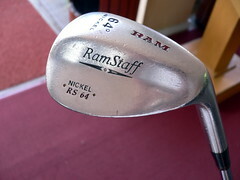 5) Loft Wedge - I got the RAM RS 64 degrees loft wedge which I bought for SGD 120 more than 10 years ago. I won't recommend this club if you are a beginner as it is a very difficult club to master but the satisfaction when you hit a good one is immense. The shot would be very dramatic as due to the 64 degree angle of the blade, the shot flies very very high into the sky and almost vertically when it descents, resulting in a backspin or at the very least a SIT i.e. the ball just sticks to the spot on the green where it lands. People would go WAH!! when you nailed it as if they were watching ESPN Golf Live! Problem with this club is that it is very difficult to master it for a fat shot (club head hits too much of the ground before striking the ball i.e. club head too low) would slice up a nice piece of turf cleanly and your ball travels a mere 1 yard away. Too thin and you topped the ball (club head too far from the ground resulting in the bottom edge of the club not able to get beneath the ball and strike it dead on i.e. the trajectory of the ball becomes horizontal more than vertical), sending the ball into oblivion and most likely incurring a penalty in the process. Probably would end up as one of those blooper scenes in Funniest Home Videos. 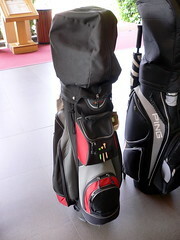 6) Putter - I got the Ping Craz-E H back in July for USD 129 (SGD 194) at a friend's pro shop in Los Angeles. A good discount considering the fact that Golfsmith was selling it at USD 149 (SGD 224) at that time. Before that I was using the Odyssey Rossie II (nicknamed Magic Putter) for over 10 years and I was so used to the feel and play of the putter that I was quite lost when my uncle took it. Here's what happened. He got the Odyssey White Hot Rossie which technically is the same putter as mine except that his is the next generation model from mine. Problem was that his was 34" in length while mine is 33". He struggled with his club as he was a head shorter that I am and being the fillial nephew that I am, I offered to swap putter thinking that 1" inch difference won't really matter. Boy, was I wrong. For someone who has been using the same putter for more than 10 years. I was like a fish out of water. I over putted each and every time as the same swing now that it gives more power due to the length of the putter extending the arc of the swing. ... until the end of the honeymoon period. Here's the thing about new golf clubs and why so many of them ended up in the second-hand shops. It's called the Honeymoon Period. For every new club, it would play sooooo wonderfully at the shop and bait you into the purchase. It will play superbly for the first couple of rounds and you find yourself patting your own back for a great find. After that, it is all downhill as your game starts to go wonky. Next thing you know it, there will be a new model on the market and its launched is plastered over all the golf magazines and golf channels. Many of these folks would probably think of ditching the current still-new club and get some money back while they still can. It's the "For-a-few-dollars-more-from-the-sale-of-the-current-club,-I-can-buy-the-new-one" mantra that is keeping the second-hand shops in business. As usual, the new club would feel fantastic at the shop which would be followed by the familiar "Ka-Ching" on the cash register. Rinse. Repeat. Ok, so I exagerrated a bit but it is not totally untrue. I have see this phenomenon countless of times. As for me, I am currently still working on the putter and yes, the honeymoon period expired. I managed to get my swing strength under control. Although both my earlier and present clubs weigh the same and are of the same length. I believe that the difference in the weight distribution of both club heads is throwing my game away. Anyway, I got that part of the problem licked and will be working on my aiming which is currently off too. What is my final bill? Let's tally up and see. As you can see, I managed to get a full set of clubs for under SGD 1000. Not a lot considering that I used my last set for more than 10 years which would work out to be less than SGD 100 per year. Still SGD 1000 may be a sizeable amount which is why I advocate the breaking down of the purchase. If you are a newbie, there is really no need to get out there to buy the woods when you won't be touching it for months until you achieve relative competency with the irons. So why fork out the money so early? 7) Expendables. I am referring to the balls, tees and the some odd barang barang (like umbrella, rain coat and a 15-footer telescopic ball retriever). For beginners, I strongly recommend buying used balls which are probably between SGD 0.70 to SGD 1.00 per ball, depending in your bargain prowess with the local jungle boy. As for the brands, I can't really recommend any as different people take to different balls differently. Personal preference would be the Titleist Pro-V1 392, Precept U-Tri, Srixon Feel, Callaway (all models) and Pinnacle (all models and especially the Noodle). As for the other brands, I'd play it if it happens to be in my bag or when they are giving them out at tournaments. The only exception is Nike which just totally don't do very well for me. The core feels very hollow as compared to the Pro V1 which has a very dense core. I call the Nike (all models) ping pong balls as they have a tendency to fly all over the place and it doesn't go very far. Next time, you have a ping pong ball and a bat, whack the ping pong ball as hard and as far as you can and you will see a wayward flight and not very far. That's the feeling I get from playing Nike balls. Ok, so this is the end of the series and I hope the information is useful. See you guys at the greens! kampungbabe: That's about right for a set of new clubs and I supposed this is on company's expense account, one can be more chin chai with the purchase. am looking at improving my fairway woods swing and getting an improved putter ... maybe a clone from shenzhen? Lynn: Hi Lynn! Welcome to the blog! Well... what can I say for virgins and their first time? Messy! Anyway, the key is to keep playing and you will get better. Don't worry about how people look at your fumbling. We all understand what it's like to be a newbie and so don't feel embarrassed. We have all been down that path before. My take on clones? Well, I would say that clones should be restricted to irons only which is what's in my bag presently if you recall my entry. Putter and Woods should be genuine as far as possible. I have personally tested (not to mention broke) quite a few clone woods from time to time and my verdict is that they are not up to par (no pun intended). Better to stick to genuine clubs but like I said about breaking up the purchase, buy them in stages. Get the putter, then fairway woods, then driver. Drop me a note or add me on MSN at voxeroshotmailcom . I am interested to know how you are progressing.